Full of charm, a unique menu, and delicious food, Cafe Teresa has been offering quality ingredients, great food and a creative mix of menu items for twenty years. Owned and operated by Michael Riccio, Cafe Teresa will celebrate it’s 20th anniversary this New Year’s Eve. After graduating from UNH from the Hotel and Restaurant program, Riccio spent about five years working across the country in restaurants. Returning to New Hampshire, Riccio, began his restaurant in the same building that was owned by his father, who operated a deli there from 1976 until 1988. Cafe Teresa offers a mixed menu of Mexican and Italian foods. Growing up in an Italian family, it seemed natural to incorporate this culture. However, Riccio wanted a broader concept. After working in the western part of the country, Riccio learned the Mexican influence and brought it home with him. When Cafe Teresa opened, they were the only local Mexican fare restaurant in the area. And, though the menu had expanded some, it has kept true to its roots over the years. During the summer months, Cafe Teresa uses as many locally grown produce as possible. Riccio works closely with Mike Cross of Mack’s Apples and, in 1994, the duo grew hot peppers specially for the restaurant. With 25 different types, there was a real craze for peppers. “They went crazy for a couple of years, growing these things,” said Riccio. When the craze died, the team decided to only grow a few different kinds. Cross still grows these peppers, and Riccio still cooks with them. Riccio also purchases his herbs from local growers when possible. Riccio said he loves the business he’s in. He has made a lot of friends and is very appreciative of everyone that has supported him throughout the last 20 years in Londonderry. “The people in the area have been great. 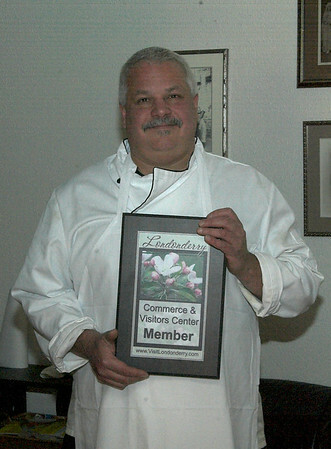 Londonderry is a great place and the people that live here are super and supportive,” he said. “It is a really nice town. We have had really good luck and it has to do with this community,” Riccio added. Cafe Teresa is open seven days per week; Mondays from 4 to 9 PM; Tuesday through Thursday from 4 to 9:30 PM; Friday and Saturday from 11:30 AM until 10:30 PM; and Sundays from 11:30 AM until 9 PM. 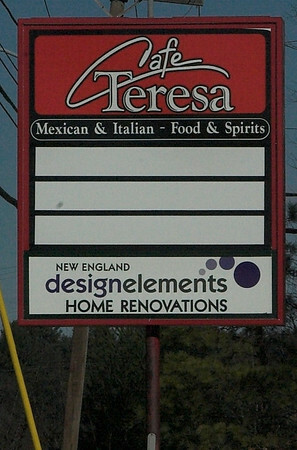 Visit Cafe Teresa at 103 Nashua Road or online here. The entire menu is available for takeout.